This hematite and magnetite specimen is from Patagonia, Argentina. Bruce got it at the Denver show and gave it to Sharon Penner. It’s about 4 inches long and pretty shiny. Hematite (Fe2O3) is a type of iron ore, which means that it contains iron which can be smelted out and used. It has a distinctive red color which means it can be used as red pigment, and is why hematite is sometimes called bloodstone. This is the main way you can identify hematite: it looks silver, but it produces a red streak. It was used in cave paintings when they wanted a red color. Hematite also can be polished and made into cabochons, but mostly, it is mined for its iron content and used for industrial purposes, such as for making steel or for X-ray shielding. Hematite is found all over the world, but primarily in Minas Gerais (Brazil), Cumbria (England), Morocco, Lake Superior, Utah (Thomas Range), and Arizona. 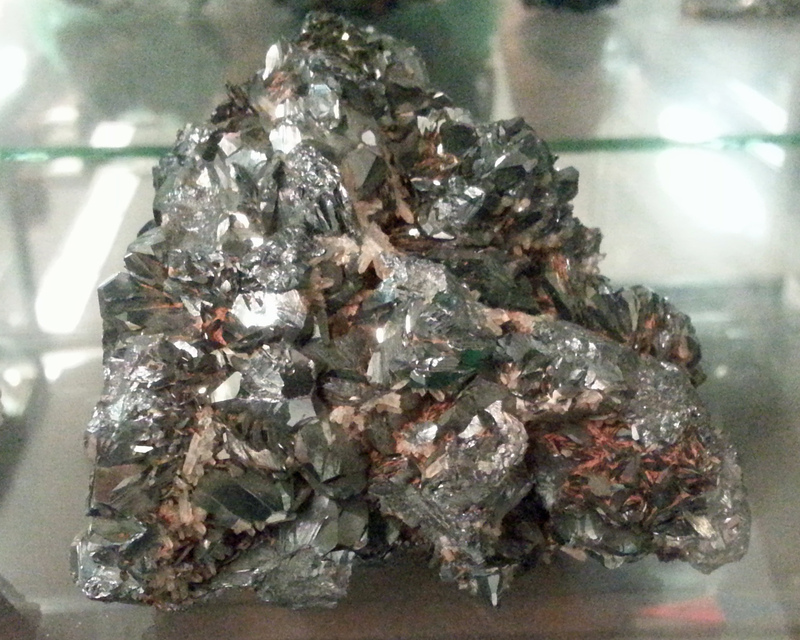 This hematite specimen is from the UMKC Sutton Museum. By the way, magnetic hematite jewelry is NOT made of hematite. The jewelry is a manmade ceramic barium-strontium ferrite magnet. See here: http://www.mindat.org/min-35948.html Hematite by itself is not magnetic, but some people think it is because it is frequently found with magnetite, which is magnetic.